A carte-de-visite portrait of Philippe, Count of Flanders, Prince of Saxe-Coburg-Gotha, and Duke of Saxony. 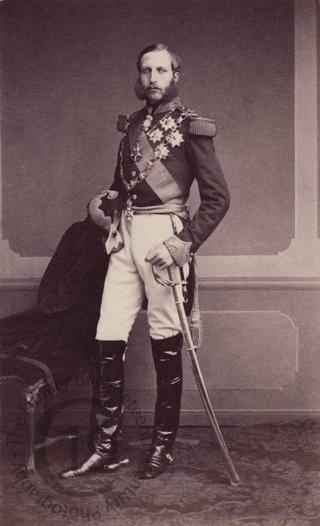 The second son of Léopold I, King of the Belgians, Philippe was born at the Palace of Laeken on 24 March 1837. He was created Count of Flanders by Royal Decree on 16 December 1840. On the death of his father in 1865, the crown passed to Philippe’s elder brother, who ruled as Léopold II. After the early death of Léopold II’s only son on 22 January 1869, Philippe was Heir Presumptive to the throne of Belgium until his own death at the Regency Palace in Brussels on 17 November 1905. Four years later the crown passed to his son, who ascended the throne as Albert I.